Yesterday, we called for the impeachment of Federal District Judge James L. Robart, who on February 3, 2017 issued a temporary restraining order barring the federal executive branch from implementing President Trump’s Executive Order temporarily barring travel from seven terrorist hotspots. It wasn’t long before other conservatives made the case for the impeachment of Judge Robart. Our friend Daniel Horowitz writing for Conservative Review argued that Congress rightfully delegated restrictionist authority to the president under section 212(f) of the Immigration and Nationality Act in the clearest terms imaginable. In addition to Article I, Section 8, Clause 4 of the Constitution and unanimous case law since our Founding gives Congress plenary power over immigration and the authority to delegate power to the executive specifically to ratchet down (again, not up) immigration, the president also has war powers to shut off immigration noted Horowitz. We have been engaged in conflict in Somalia, Yemen, and many of these countries and have ongoing military operations in Iraq, Syria, and Libya. In fact, throughout our history, we have never admitted immigrants in such large quantities from nations that were the subject of ongoing wars. Yet judges are mandating we take them in! As for refugees, the president was specifically given the power to set the cap and criteria for who is let in as a refugee (more so than any other area of immigration) under 8 U.S.C. 1157. The notion that a president can’t place a moratorium on refugees (in this case, from any country, not just Muslim-majority ones) until we have a better vetting system in place, defies comprehension. Most egregiously, Judge James Robart — who should be impeached says Daniel Horowitz — said that Trump’s prioritization of persecuted religious minorities is unconstitutional, even though it is literally required by current law and the entire spirit of refugee status in the first place. Klukowski is director of the Center for Religious Liberty at the Family Research Council, a fellow and senior analyst with the American Civil Rights Union, and a research fellow with Liberty University School of Law and has written briefs on constitutional issues in federal courts across the country, including the U.S. Supreme Court. For starters, says Klukowski, Judge Robart did not have jurisdiction to rule on at least several of the ten counts in the lawsuit. The judicial power is defined by Article III of the Constitution, which Klukowski points out, requires that a plaintiff must have standing for a federal court to have power to rule on the merits of a lawsuit. A party has standing if it has suffered a concrete particularized injury that is traceable to the defendants and can be redressed by a favorable court ruling. But as the Supreme Court has made clear, a plaintiff must prove that it has standing for each issue raised in the lawsuit. It is possible—not definite, but possible—that the states are correct in asserting that their Tenth Amendment prerogatives and sovereigns are being violated by the federal government. However, concluded Klukowski, the states unquestionably lack standing to bring some of the issues in this kitchen-sink lawsuit. Washington and Minnesota claim violations of the Establishment Clause and the Religious Freedom Restoration Act (RFRA), for example. Those rights can only be raised by natural persons or by corporate organizations. A state has no rights under that constitutional provision or federal statute, so cannot sue over alleged violations. And despite what Robart said, a state cannot assert the personal rights of its citizens concluded Klukowski. But it gets worse says Ken Klukowski. The Supreme Court has reiterated countless times that when a federal court lacks subject-matter jurisdiction in a lawsuit, the only power the court has is to explain why it cannot claim jurisdiction, then dismiss the case. That’s what should have happened for many of the claims in this lawsuit, rather than taking the extreme step of issuing a TRO. Which leads to another problem with the TRO: Rule 65(b)(2) of the Federal Rules of Civil Procedure requires a court to “describe the injury” suffered by the plaintiff. Robart claimed that Washington and Minnesota had carried their burden of showing they had a substantial likelihood of success on the merits of their lawsuit, but never says which ones. The states obviously cannot succeed on a claim they have no standing to raise in the first place notes Klukowski and what’s more, Robart failed to provide the legal reasoning for his decision. Next, court injunctions should never be broader than necessary to remedy the injury suffered by the plaintiffs. Those plaintiffs are two states out of 50. Robart offers no explanation why blocking this EO in all 50 states from coast to coast is necessary to take care of Washington and Minnesota concluded Ken Klukowski. 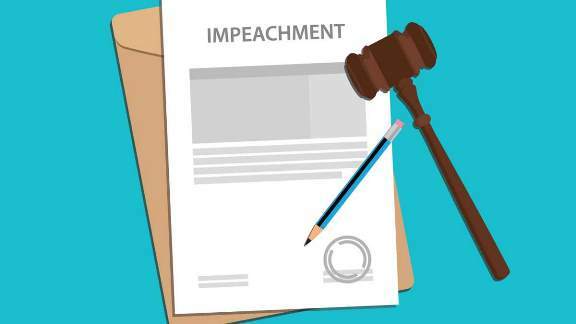 While Ken Klukowski stops short of calling for the impeachment of Judge Robart, his article adds a number of additional points to what we think should be a strong bill of impeachment of Judge James L. Robart for issuing an order ultra vires – acting beyond his jurisdiction. Submitted by email_registrat... on Thu, 02/09/2017 - 18:21. Submitted by email_registrat... on Tue, 02/07/2017 - 14:47. Where Can I Sign to have him removed from office and all other liberal RINOS appointed by the Bushes? Submitted by mike on Tue, 02/07/2017 - 09:44. Congress also has the power to create and abolish courts, districts, and circuits, under the Constitution. It should move quickly to abolish the district where Robart serves.